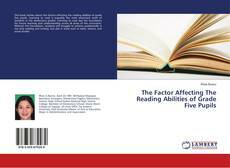 This book tackles about the factors affecting the reading abilities of grade five pupils. Learning to read is arguably the most important work of students in the elementary grades. Learning to read lays the foundation for future learning and understanding across all areas of the curriculum. Without this foundation, students will struggle to achieve academically in not only reading and writing, but also in areas such as math, science, and social studies.